People sometimes drink apple cider vinegar as an alternative remedy for conditions including diabetes, cancer, weight loss, high blood pressure and acne, although the research results on the potential benefits of doing so are still preliminary and conflicting. Speak with your doctor before using vinegar in amounts larger than those found in food to make sure this would be safe for you. According to eMedTV, no set dosage of apple cider vinegar has been proven to be safe and effective. However, people often use doses ranging from a teaspoon to a tablespoon taken with a full glass of water up to three times per day. The acidic nature of apple cider vinegar can cause the enamel of your teeth to become eroded, irritate your throat or interfere with blood-thinning medications, diuretics or insulin. Drinking too much vinegar could cause your potassium levels to fall too low, and drinking straight vinegar could cause damage to your esophagus, according to a review article published in "Medscape General Medicine" in 2006. 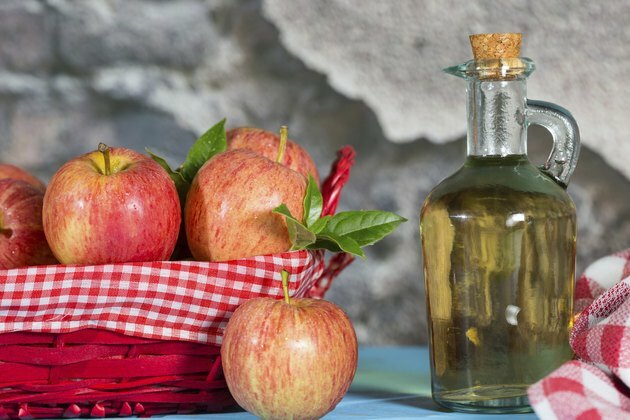 What Is the Difference Between Cider Vinegar & Apple Cider Vinegar? How Does Drinking Vinegar Affect the Body?